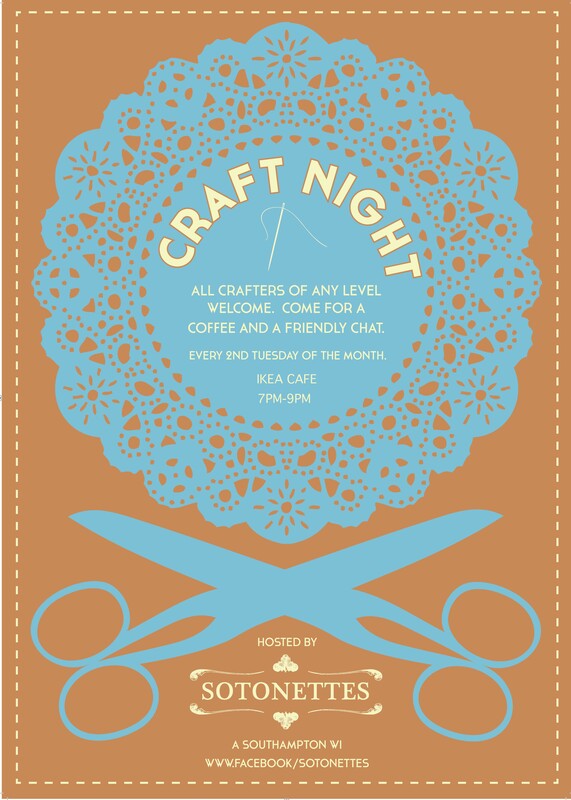 Our craft nights are held on the second Tuesday of every month from 7pm until 9pm in the IKEA restaurant. This evening is more informal than the main Sotonettes meeting each month: both members and non-members can attend (no charge). If you have a craft which you’re already working on, bring it along; if not, don’t worry – some people at each evening are more than happy to teach a craft they know well or you can just have a chat and a catch-up with other ladies over some very tasty cake and hot chocolates! To get free tea/coffee, get an IKEA Family Card (to apply, click here). The evenings start at 7pm but please turn up whenever you like! We finish at 9pm but these really are informal evenings and people tend to come and go as their plans allow. Contact Permissions Sotonettes WI will use the information you provide on this form to be in touch with you and to provide updates. You can change your mind at any time by clicking the unsubscribe link in the footer of any email you receive from us, or by contacting us at sotonettes@gmail.com. We will treat your information with respect. For more information about our privacy practices please visit our website. By clicking below, you agree that we may process your information in accordance with these terms.